A modern appearance paired with a striking mechanic of movement, light-footedness, and elegance – that is what Safwan Nayaar embodies whenever he presents himself. And so he did once again - strong as a rock - at the 6th Kuwait National Championship where the bay two years old Fayad Al Fayyad son convinced the international judge's panel and was awarded Unanimous Kuwait National Gold Champion Junior Colt. Winning this prestigious title, Safwan Nayaar lived up to his name, which is Arabic for “rock”. Silver went to the FA El Rasheem son D Rashad with Shaqran Al Anjal, by Habibi being Bronze Champion. Kuwait is an oasis in a land of desert plains and has excellent museums, a wonderful souq and, of course, a Corniche of combed beaches and lively restaurants. It all adds up to what could be the Gulf's most intriguing destination; especially for Arabian horse enthusiasts who never tire of traveling to the cradle of one of the most ancient and contested corners of the world. The show scene is quickly expanding in Kuwait and the official State Stud Bait Al Arab hosted the 6th edition of Kuwait’s National Championship over three days. Bait Al Arab is not only the state stud but an educational and equine oasis supported by the state and breeders of Kuwait who are dedicated to preserving one of their nation’s most cherished cultural treasures – the Arabian Horse. Back to the championship: Habeeb Khalifah Al Azmi is the proud owner and breeder of the Gold Champion Yearling Colt, Dhahab Al Naderat. His sire is AJ Fenjan out of the superb RGA Kouress and sired by Ajman Moniscion, making Dhahab Al Naderat a representative of the strong sire line of Padrons Psyche through WH Justice, just like the Junior Colt Champion Safwan Nayyar. Again a Dubai Arabian Horse Stud bred colt garnered Silver: D Surour, by FA El Rasheem. Bronze went to Khaled Alfala, by Khaled Al Hamad. All good things come in threes. Asayel Stud sent their stallion Asayel Shamal back into the show ring. The Aja Hassan (by WH Justice) son out of Al Mazyona, by Sinan Al Rayyan accomplished Kuwait Arabian Breeders Show Gold Champion Senior Stallion earlier this year and took again Gold. Warsong CS, by SF Veraz achieved Silver with Mnawer Athbah, by Psytadel winning Bronze. Let’s talk about the females. Bred in the USA, the EKS Alihandro daughter RShediah Alkhashab took the Gold Championship of the Yearling Fillies. She is a delicate bay out of Symphony of Love, a precious daughter of Brazilian and U.S. National Champion Stallion El Nabila B, who resides in Europe at the moment. 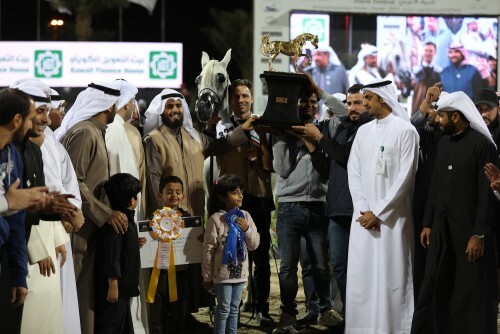 The proud owner of Rshediah Alkhashab is Mubarak Hamdan Al Khashab, who celebrated more successes at the Kuwait Nationals with TM Frida (Bronze Champion Junior Filly), Sateena LNJ (Silver Champion Junior Filly), and Amanda Pegasus (Silver Champion Senior Mare). Silver Champion Yearling Filly was awarded to Dana Alkhamiss, by Sabea AlMuawd, with Lulu Al Wawan, by SMA Magic One winning Bronze. Gold Champion Junior Filly was achieved by the striking bay Sultanah Al Arja, out of PA Perdita by EVG Gentry. Bred by Palmetto Arabians Sultanah Al Arja is owned by Abdulaziz Shuraiaan. This two years old filly already won two Bronze championships as a yearling in Kuwait and is the first foal of her sire A Jericho, a U.S. Reserve National Champion Yearling Colt. 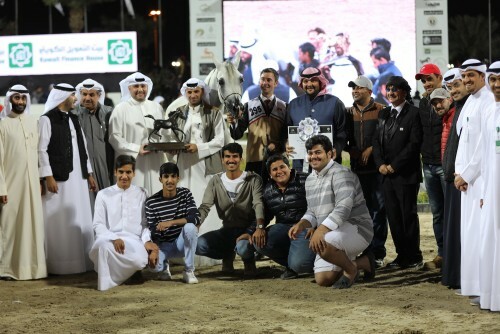 Banat Alreeh Stud celebrated the success of their QR Marc daughter D Aida, who was awarded Gold Champion Senior Mare. D Aida’s dam is Polish bred Simourah W, by Garsal out of Sima. The grey mare is not only a show champion but also a champion producer. Her son Jassar Al Jassar, by Habibi was named 2016 Kuwait National Silver Champion Junior Colt. The Senior Mares Championship was a really close decision. Both, D Aida and aforementioned Amanda Pegasus received 12 points in the championship, with D Aida winning due to higher points in the class. Therefore the Shaezz El Madan daughter Amanda Pegasus garnered Silver and another Dubai Arabian Horse Stud bred mare took Bronze: D Thirka, by Marajj. We wish to thank Bait Al Arab Kuwait State Stud for hosting the National Championship and for partnering with Arabian Horse Results.